A stunning set of historic, highly collectable gold dollar coins containing each of the three distinct gold dollar types. In January 1848, gold was discovered in a river in California. Within months the region was besieged by thousands of gold hunters hoping to make their fortune. The gold they found would have a profound impact on monetary history throughout the West, not least in the United States itself. 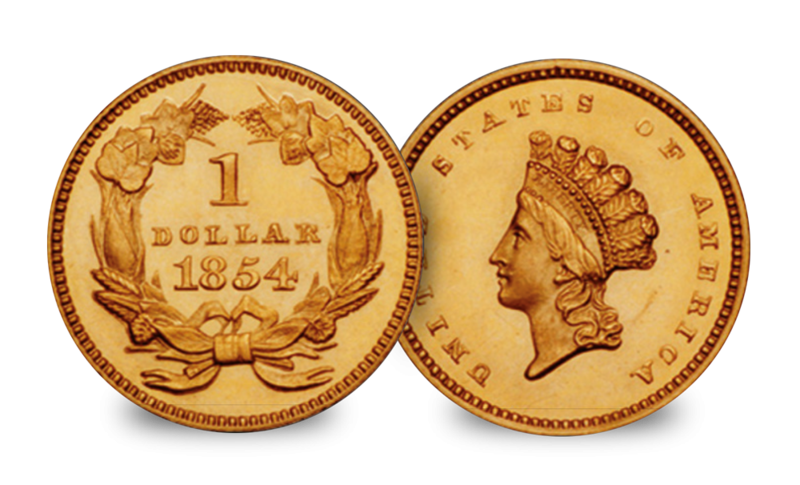 A gold dollar had been proposed several times in the 1830s and 1840s but was not initially adopted. Congress was finally galvanised into action by the increased supply of bullion caused by the California gold rush, and in 1849 authorised a gold dollar to be issued. 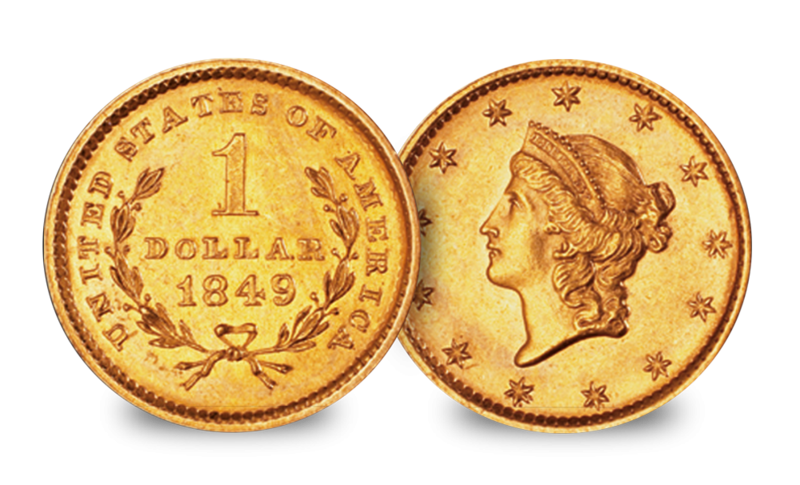 The first Gold Dollar, known as type I, featured a portrait of Liberty wearing a coronet on the obverse, while the reverse displayed a wreath surrounding the date and denomination. It was produced from 1849 through 1854. At just 13 mm across the gold $1 was to be the United States’ smallest coin. Its size, however, was not unproblematic. The old silver dollars had been large and heavy but the tiny gold dollar was easy to lose and a whole day’s pay could slip away with the loss of just one coin. In 1854 the diameter was enlarged slightly to 15mm, to make the coin more convenient to handle. These Type II dollars featured the Indian princess design and were struck in 1854 and 1855, plus in 1856 at the San Francisco Mint only. The design however created problems, as it was not possible for the metal in the dies to flow into the deep recesses of Miss Liberty's portrait on the obverse and at the same time into the central date digits on the reverse. To correct this, the Type II portrait, with Miss Liberty in shallower relief, was created in 1856. Type III dollars, featuring a modified portrait of an Indian princess, were made from 1856 through 1889. It was the same size as the previous type but the obverse was re-engraved with a larger and flatter portrait of the Indian Princess to help retain the sharpness of the image. On the reverse was the agricultural wreath of cotton, corn, tobacco and wheat – representing the produce of both North and South – that had been introduced on the gold dollar in 1854. Following the Civil War, the number of gold dollars in circulation dropped, mintages grew smaller and smaller and the gold dollar was considered to be an inconvenient coin of ‘little practical use’. 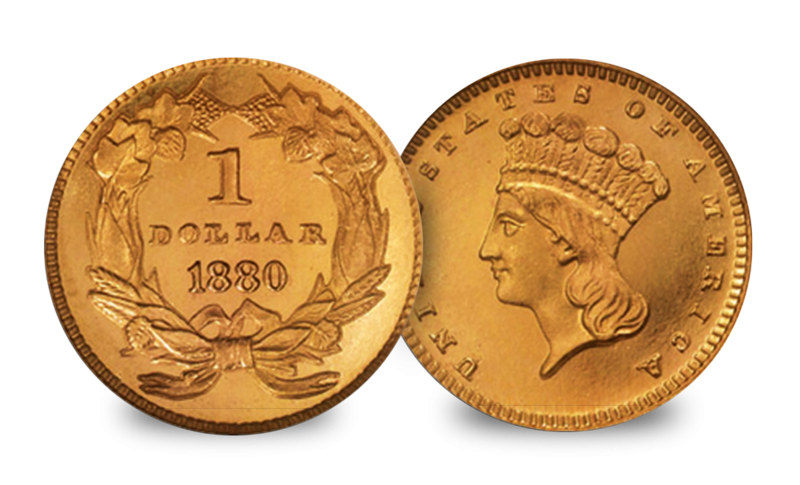 The last gold $1 was minted in 1889 and the history of circulating $1 gold coins came to an end. Almost immediately after the denomination was phased out in 1889, the Gold Dollar became a popular collectable. Today each of these three different types has now been brought together in one historic set.